: Bald eagles are kings of the sky once more. 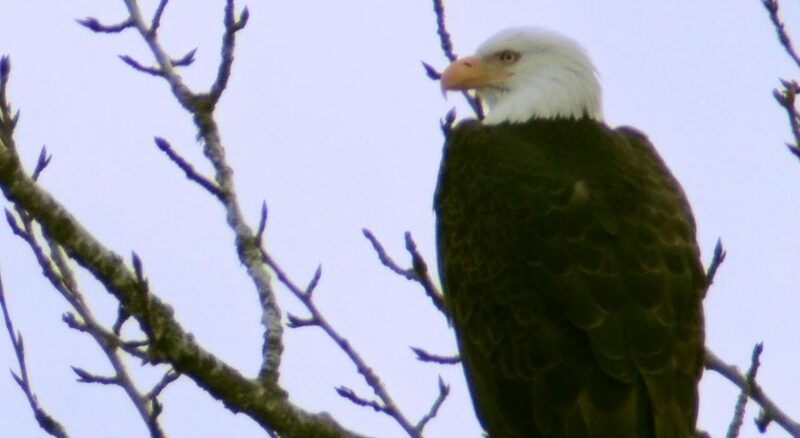 People can explore the great Oregon outdoors with a bit more pride this spring because bald eagles are back from the brink of extinction. If you enjoy watching our national symbol soar across Oregon’s skyline, you’ve many places you can visit for amazing wildlife moments. Bald eagles are kings of the sky once more. After a period of rapid population decline in the 1960’s, bald eagle numbers have soared the past three decades and now there are more than 570 nesting pairs across Oregon. 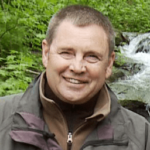 In fact, the birds have done so well in so many places that the Oregon Fish and Wildlife Department recently announced that time had come to remove the birds from that state’s Endangered Species List. Today, you can see bald eagles in every region of the state: from soaring along coastal headlands like Cape Meares State Park or perched in the cottonwoods above industrial Portland’s Smith and Bybee Wetlands or across the open fields of the greater Willamette Valley and eagles are frequently seen throughout the entire Columbia River basin. At Jackson Bottom Wetlands Preserve, a pair of eagles has built a massive nest that’s proven productive over the past three years and they’ve raised eaglets each season. In fact, the nest is the third in the past 14 years, (the others blew down in severe storms.) Sarah Pinnock, Jackson Bottom Wetlands Preserve Education Specialist, said that biologists estimate the pair has raised a dozen youngsters. 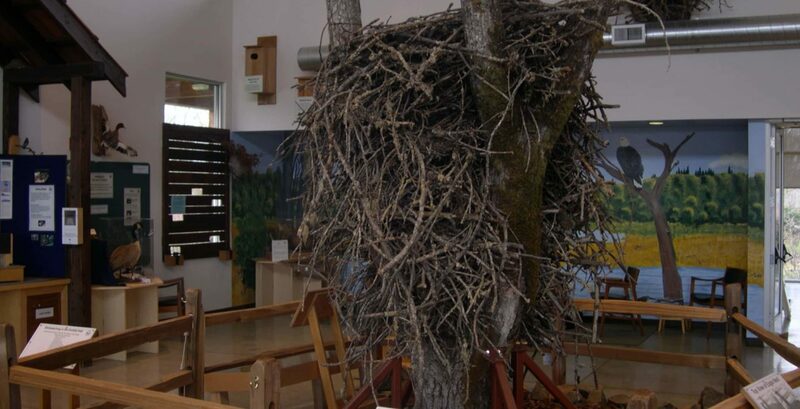 Inside the nearby Jackson Bottom Wetlands Preserve Education Center, you get a close up look to amazing eagle architecture in an actual nest. The nest was rescued from a giant cottonwood that had been damaged in a windstorm and was falling over. The nest was cut, removed and transported intact to the center so to teach us more about eagles. Pinnock added that each year, the eagle parents will add up to two feet of new material to the nest. The birds work together and they weave sticks and branches into the existing nest with their beaks and talons. The female eagle will lay up to three eggs each March and the eggs usually hatch within a month. The chicks will fledge from the nest in about 8 weeks. Young eagles stay with their parents through July and then the entire family disappears. The parents return to the nest site again in November. Bald eagles are kings of the sky once more.